Zen Mind, Beginner’s Mind: Informal Talks on Zen Meditation and Practice – loudlatinlaughing – Euge! Euge! 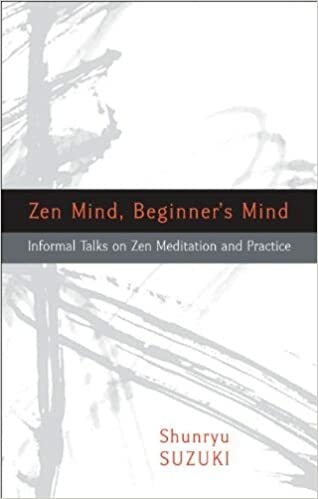 I probably should have more appreciation for this collection of teachings from Shunryu Suzuki, founder of the Zen Center down the street that I’m learning meditation from. But I’m not attached to them, preferring to focus on his statement that our understanding of Buddhism “should not be just gathering many pieces of information, seeking to gain knowledge. Instead, you should clear your mind.” I am sweeping away his teaching from my mind as I tidy it. Just sit. Just breathe. That is all there is. This collection is a bit tedious, and I like Suzuki’s own reaction in 1970 to seeing the book for the first time: “Looks like a good book. But I didn’t write it.” It’s the summary and cleanup work of some of his disciples, putting pen to paper and smoothing out his English. Instead of reading it, I recommend meditating instead.